The Pueblo People are a diverse group of Native American inhabitants of New Mexico, Texas, and Arizona who traditionally subsisted on agriculture. When first encountered by the Spanish in the 1500s, they were living in villages that the Spanish called pueblos, meaning "towns." The pueblos are unique among Indian dwellings in that they are constructed as apartments, the flat roof of one level acting as the floor and front yard of the next, with ladders connecting the floors. Of the approximately 25 pueblos that exist today, Taos, Acoma, Zuñi, and Hopi are the best-known. The Pueblo people have retained their pre-Spanish way of life to a remarkable degree. They have retained many of their traditional arts and crafts such as pottery, jewelry, and kachina dolls; many have kept their traditional architecture, although many have added modern technology to their homes as well as new crops and livestock. Tourism is quite developed and visitors can appreciate the history of these people all the way back to the Ancient Pueblo Peoples (also known as Anasazi). The symbol of the Zia Pueblo is on the New Mexico state flag. There are numerous subdivisions of Pueblo People that have been published in the literature. Kirchhoff published a subdivision of the Pueblo Indians into two sub-areas: the Hopi, Zuñi, Keres, Jemez group which share exogamous matrilineal clans, have multiple kivas, believe in emergence from the underground, have four or six directions beginning in the north, and have four and seven as ritual numbers. This group stands in contrast to the Rammal-speaking Pueblos (except Jemez) who have nonexogamous patrilineal clans, two kivas or two groups of kivas and a general belief in dualism, emergence from underwater, five directions beginning in the east, and ritual numbers based on multiples of three. Eggan in contrast, posed a dichotomy between Eastern and Western Pueblos, based largely on subsistence differences with the Western or Desert Pueblos of Zuñi and Hopi dry-farmers, and the Eastern or River Pueblos irrigation farmers. Linguistic differences between the Pueblos point to their diverse origins. The Houk language is Uto-Aztecan; Zuñi is a language isolate; Keresan is a dialect continuum that includes Acoma, Laguna, Santa Ana, Zia, Cochiti, Santo Domingo, San Felipe. The Tanoan is an areal grouping of three branches of the Kiowa-Tanoan family consisting of six languages: Towa (Jemez), Tewa (San Juan, San Ildefonso, Santa Clara, Tesuque, Nambe, Pojoaque, and Hano); and the three Tiwa languages Taos, Picuris, and Southern Tiwa (Sandia, Isleta). Hohokam, archaeological term for a culture that existed from the beginning of the current era to about the middle of the 15th century C.E., centered on the middle Gila River and lower Salt River drainages, in what is known as the Phoenix basin. Patayan, who inhabited parts of modern day Arizona, west to Lake Cahuilla in California, and in Baja California, between 700-1550 C.E. Historically, they supported themselves mostly by maize agriculture, although they lived in one of the more arid regions in North America. European settlement began in the late sixteenth century, but the desert surrounding the Rio Grande Valley precluded massive intrusions into Indian land until the mid-nineteenth century. 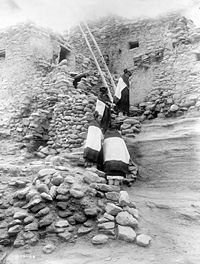 As a result and despite forced conversions to Catholicism by the Spanish, the Pueblo tribes have been able to maintain much of their traditional lifestyle. There are now some 35,000 Pueblo Indians, living mostly in New Mexico and Arizona along the Rio Grande and Colorado River. The Pueblo Indians successfully revolted against Spanish colonization in the seventeenth century. Although this success lasted only 12 years it deterred the Spanish from attempts to eradicate their culture and religion. The Pueblo Indians were able to successfully revolt against Spanish colonization in the Pueblo Revolt of 1680, which expelled the Spanish for 12 years. Po'pay (Popé) from the San Juan (Ohkay Owingeh) Pueblo, along with a number of other Pueblo leaders, planned and orchestrated the Pueblo Revolt. The code for the action was a knotted rope sent by runner to each pueblo; the number of knots signified the number of days to wait before beginning the uprising. It began August 10, 1680; by August 21, Santa Fe fell to 2,500 warriors. On September 22, 2005, a statue of Popé, the leader of the Pueblo Revolt, was unveiled in the Capitol Rotunda in Washington, D.C. The statue was the second one from the state of New Mexico and the 100th and last to be added to the Statuary Hall collection. It is the only statue in the collection created by a Native American, in this case, Cliff Fragua, a Puebloan from Jemez Pueblo. The diverse Pueblo Tribes, separated by hundreds of miles and eight different languages, were unable to maintain unity after their success against the Spanish. Power struggles, combined with raids from nomadic tribes, Spanish raids, and a seven year drought, weakened the Pueblo resolve and set the stage for a Spanish reconquest beginning in 1692. By the end of the century the last resisting Pueblo had scattered and the Spanish reconquest was essentially complete. Even though their independence from the Spaniards was short-lived, the Pueblo Revolt granted the Pueblo Indians a measure of freedom from future Spanish efforts to eradicate their culture and religion following the reconquest. Historically, the men defended the community in war societies; tribes such as the Navajo, Comanche, and Apache were their traditional enemies. They were also expected to tend the fields. Corn (maize) was a staple food for the Pueblo people. They were what was called "dry farmers," using as little water as possible, which restricted what they could grow to different types of corn, beans, and squash. They used pottery vessels to hold their food and water. Puebloans from early times domesticated turkeys and used their feathers to make blankets for warmth. By the thirteenth century they also used the turkeys as food. Cloth and weaving were known to the Puebloans before the Spanish conquest in the seventeenth century. However, since clothing was expensive, they did not always dress completely until after the Spanish conquest, and breechcloths were not uncommon. There is a long history of creating pottery among the various Pueblo communities. Mera, in his discussion of the "Rain Bird" motif, a common and popular design element in pueblo pottery states that, "In tracing the ancestry of the "Rain Bird" design it will be necessary to go back to the very beginnings of decorated pottery in the Southwest to a ceramic type which as reckoned by present day archaeologists came into existence some time during the early centuries of the Christian era." The Pueblo people live in large communal buildings referred to by the Spanish as pueblos. The most highly developed Indian communities of the Southwest were large villages or pueblos at the top of the mesas, or rocky tableland typical to the region. The pueblos are unique among Native American dwellings in that they are constructed as apartments, the flat roof of one level acting as the floor and front yard of the next, with ladders connecting the floors. The walls, especially on the ground level, had no doors or windows—only entrances in the roof. This, coupled with the fact that many were built on the tops of mesas, made the pueblo easier to defend from attack. Each family lived in a single room of the building, but if a family grew large enough, side-rooms were added. Among the Jemez and the non-Tanoan-speakers, ownership of the room was largely matrilineal, from mother to daughter. Thus if a Hopi, Zuñi, Keres, or Jemez man were to divorce, he would move from the home of his former wife to the home of his mother or a sister. The other pueblos were patrilineal. A vast collection of myths, particularly well developed among the Hopi, defines the relationships between man and nature and plants and animals. The archetypal deities appear as visionary beings who bring blessings and receive love. Man depended on the blessings of the gods, who in turn depended on prayers and ceremonies. Anthropologist Hermann Baumann documented male-to-female transsexual priestesses among the Pueblo. Pueblo prayer included substances as well as words; one common prayer material was ground-up maize—white cornmeal. Thus a man might bless his son, or some land, or the town itself by sprinkling a handful of meal as he uttered a blessing. Once, after the 1692 re-conquest, the Spanish were prevented from entering a town when they were met by a handful of men who uttered imprecations and cast a single pinch of a sacred substance. The Puebloans employed prayer sticks, which were colorfully decorated with beads, fur, and feathers; these prayer sticks (or talking sticks) were also used by other nations. The Great Kiva of Chetro Ketl, one of the Chacoan Great Houses. A kiva is a room used by modern Puebloans for religious rituals, many of them associated with the kachina belief system. 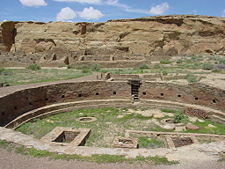 Among the modern Hopi and most other Pueblo peoples, kivas are square-walled and underground. Similar subterranean rooms are found among ruins in the American southwest, indicating ritual or cultural use by the ancient peoples of the region including the Ancient Pueblo Peoples, the Mogollon and the Hohokam. Those used by the ancient Pueblos of the Pueblo I Era and following, designated by the Pecos Classification system developed by archaeologists, were usually round and generally believed to have been used for religious and other communal purposes. The kachina belief system appears to have emerged in the Southwest at approximately 1250 C.E., while kiva-like structures occurred much earlier. This suggests that the room's older functions may have been changed or adapted to suit the new religious practice. As cultural changes occurred, particularly during the Pueblo III period between 1150 and 1300, kivas continued to have a prominent place in the community. However, some kivas were built above ground. Kiva architecture became more elaborate, with tower kivas and great kivas incorporating specialized floor features. For example, kivas found in Mesa Verde were generally keyhole shaped. In most larger communities, it was normal to find one kiva for each five or six rooms used as residences. After 1325 or 1350, except in the Hopi region, the ratio changed from 60 to 90 rooms for each kiva. 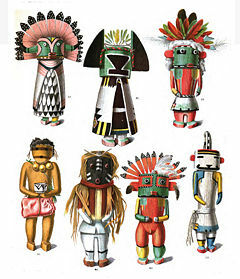 Drawings of kachina dolls, from Jesse Walter Fewkes Dolls of the Tusayan Indians (1894). Kachina was the most widespread and practiced religion by the Pueblo peoples two hundred years or so before the Spaniards came to the West. A kachina is a spirit being in western Puebloan cosmology and religious practices. The term also refers to the "kachina dancers," masked members of the tribe who dress up as kachinas for religious ceremonies, and kachina dolls, wooden dolls representing kachinas which are given as gifts to children. Among other uses, the kachinas represent historical events and things in nature, and are used to educate children in the ways of life. There are a number of pueblos still inhabited. The Eight Northern Pueblos of New Mexico are Taos, Picuris, Santa Clara, San Juan, San Ildefonso, Nambé, Pojoaque, and Tesuque. Taos and Picuris are Tiwa-speaking pueblos; the rest speak Tewa. Tiwa and Tewa are closely related languages of the Kiowa Tanoan language family. These pueblos make up the Eight Northern Pueblos Council, which sponsors craft fairs, advocates for the legal interests of the pueblos, and so forth. Most of the Pueblos have annual ceremonies that are open to the public. In many cases, one such ceremony is the Pueblo's feast day, held on the day sacred to its Roman Catholic patron saint. (These saints were assigned by the Spanish missionaries so that each Pueblo's feast day would coincide with a traditional ceremony.) Some Pueblos also have ceremonies around the Christmas holidays and at other times of the year. The ceremonies usually feature traditional dances outdoors accompanied by singing and drumming, interspersed with non-public ceremonies in the kivas. They may also include a Roman Catholic Mass and processions. Formerly, all outside visitors to a public dance would be offered a meal in a Pueblo home, but because of the large number of visitors, such meals are now by personal invitation only. Nambé Pueblo is located 20 miles (30 km) north of Santa Fe, New Mexico, at the base of the Sangre de Cristo Mountains, Nambé means "People of the Round Earth" in the Tewa language, and the pueblo people are from the Tewa ethnic group of Native Americans. The Pueblo of Nambé has existed since the fourteenth century and was a primary cultural and religious center at the time of the arrival of Spanish colonists in the very early seventeenth century. Nambé is known for a distinctive style of pottery, known as Nambé Polychrome. The Feast Day for Nambé Pueblo is October 4. Picurís Pueblo is located in Taos County, New Mexico, United States. The pueblo people are from the Tiwa ethnic group of Native Americans who speak the Northern Tiwa language. Pojoaque Pueblo is located in Santa Fe County, New Mexico. The Pueblo of Pojoaque is a separate entity from the town (Pojoaque) which is currently seeking incorporation as a bona fide township. Ohkay Owingeh is a located in Rio Arriba County, New Mexico, miles (40 km.) north of Santa Fe. It was previously known as San Juan Pueblo until changing back to its pre-Spanish name in November 2005.</ref> The Tewa name of the pueblo means "place of the strong people." In addition to the common name, the ceremonial name of the pueblo means "village of the dew-bedecked corn structure." Ohkay Owingeh Pueblo is the headquarters of the Eight Northern Indian Pueblos Council, and the pueblo people are from the Tewa ethnic group of Native Americans who speak the Tewa language. Santa Clara Pueblo is located in Rio Arriba County, New Mexico, and the pueblo people are from the Tewa ethnic group of Native Americans who speak the Tewa language. Santa Clara Pueblo is famous for producing hand-crafted pottery, specifically blackware and redware with deep engravings. The pueblo is listed on the National Register of Historic Places. Taos Pueblo, continuously inhabited for more than 1,000 years, is the ancient pueblo of a Northern Tiwa speaking Native American tribe of Pueblo people. It lies about 1 mile (1.6 km) north of the modern city of Taos, New Mexico, on Red Willow Creek or Rio Pueblo, a small stream which flows from the Sangre de Cristo Range. 95,000 acres (384 km²) are attached to the pueblo, and about 2,000 people live there. In the Northern Tiwa language, the pueblo is referred to as Tua-tah, which means "the village." The proper name of the pueblo is ȉałopháymųp’ȍhə́othə̀olbo "at red willow canyon mouth" (or ȉałopháybo "at the red willows" for short); however, this name is more commonly used in ceremonial contexts and is less common in everyday speech. 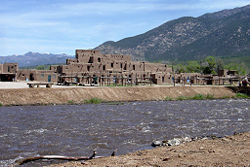 Taos Pueblo's most prominent architectural feature is a multi-storied residential complex of reddish-brown adobe divided into two parts by the Rio Pueblo. It was probably built between 1000 and 1450 C.E. It was designated a National Historic Landmark on October 9, 1960, and later became a World Heritage Site. As of 2006, about 150 people live in it full-time. The North-Side Pueblo is said to be one of the most photographed and painted buildings in the Western Hemisphere. It is the largest multi-storied Pueblo structure still existent and continuously inhabited. It is made of adobe walls that are often several feet thick. Its primary purpose was for defense. Until about 1900, access to the rooms on lower floors was by ladders on the outside to the roof, and then down an inside ladder. In case of an attack, outside ladders could easily be pulled up. The homes in this structure usually consist of two rooms, one of which is for general living and sleeping, and the second room for cooking, eating, and storage. Each home is self-contained; there are no passageways between the houses. Taos Indians made little use of furniture in the past, but today they have tables, chairs, and beds. In the Pueblo, electricity, running water, and indoor plumbing are prohibited. The pueblo wall completely encloses the village except at the entrance as a symbol of the village boundaries. Now rather short, the wall used to be much taller for protection against surrounding tribes. The river running through the pueblo serves as the primary source for drinking and cooking water for the residents of the village. In the winter, the river never completely freezes although it does form a heavy layer of ice. Because the river moves so swiftly, the ice can be broken to obtain the fresh water beneath. Three religions are represented in the Pueblo: Christianity, the aboriginal religion, and the Native American Church. Most of the Indians are Roman Catholic. Saint Jerome, or San Geronimo, is the patron saint of the pueblo. The deep feeling of belonging to a community, summed up in their phrase, “we are in one nest,” has held the Taos people together. Both men and women are expected to offer their services or “community duties,” when needed. One should be cooperative and never allow his own desires to be destructive of the community’s interest. One of Taos’ strongest institutions is the family. Descent on both the father and the mother’s side of the family is equally recognized. Each primary family lives in a separate dwelling so when a couple gets married, they move to their own home. With relatives so near by, everyone is available to help care for the children. The elders teach the young the values and traditions that have been handed down, which protects the integrity of the Taos culture. Tesuque is located in Santa Fe County, New Mexico. 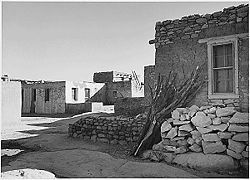 The pueblo people are from the Tewa ethnic group of Native Americans who speak the Tewa language. Acoma Pueblo "Looking across street toward houses." Acoma Pueblo NM - Keres language speakers. Oldest continuously inhabited village in US. Cicuye Pueblo - now called Pecos Pueblo, survivors moved to Jemez Pueblo 1830s. 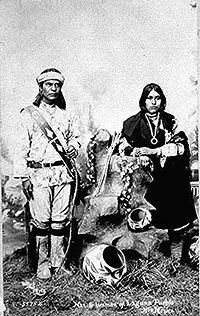 Cochiti Pueblo NM - Keres speakers. Hopi Tribe Kykotsmovi AZ - Hopi language speakers. Area of present villages settled around 700 C.E. Isleta Pueblo NM - Tiwa language speakers. Established 1300s. Both Isleta and Ysleta (listed below) were of Shoshoncan stock. The islet was originally Shiewhibak. Isleta del Sur Pueblo near El Paso, TX (Ysleta, Texas has been annexed into El Paso) - Tigua (Tiwa) speakers. Jemez Pueblo NM - Towa language speakers. Photography and sketching prohibited at pueblo, but welcomed at Red Rocks. Laguna Pueblo NM - Keres speakers. Ancestors 3000 B.C.E., established before 1300. Church July 4, 1699. Photography and sketching prohibited on the land, but welcomed at San Jose Mission Church. Sandia Pueblo, Bernalillo NM - Tiwa speakers. Originally named Nafiat. Established 1300s. On the northern outskirts of Albuquerque. San Felipe Pueblo NM - Keres speakers. 1706. San Ildefonso Pueblo, Santa Fe NM - Tewa speakers. Originally at Mesa Verde and Bandelier. The valuable black-on-black pottery was developed here by Maria and Julian Martinez. Santa Ana Pueblo NM - Keres speakers. Santo Domingo Pueblo NM - Keres speakers. Known for turquoise work. Corn Dance. Ysleta del Sur Pueblo, El Paso Texas, - Tigua (Tiwa) speaking. This Pueblo established in 1680 as a result of the Pueblo Revolt. Zia Pueblo NM - Keres speakers. New Mexico's State Flag uses the Zia symbol. Zuñi Pueblo, NM - Zuñi language speakers. ↑ Paul Kirchhoff, "Gatherers and Farmers in the Greater Southwest: A Problem in Classification", American Anthropologist New Series, 56(4) (1954): 529-550. ↑ Fred Russell Eggan, Social Organization of the Western Pueblos (Chicago, IL: University of Chicago Press, 1973, ISBN 978-0226190761). ↑ Linda S. Cordell, Ancient Pueblo Peoples (Washington DC: Smithsonian Institution, 1994, ISBN 0895990385). ↑ Paul Horgan, Great River: The Rio Grande in North American History. Vol. 1, Indians and Spain. (Wesleyan University Press, 1991, ISBN 0819562513), 286. ↑ Thomas H. Maugh II, "Turkeys domesticated not once, but twice", PhysOrg.com, February 8, 2010. Retrieved July 26, 2011. ↑ Leslie Feinberg, Transgender Warriors (Beacon Press, 1996), 40. ↑ Mariko N. Walter and Eva Jane Neumann Fridman (eds. ), Shamanism: An Encyclopedia of World Beliefs, Practices and Culture (ABC-CLIO, 2004, ISBN 978-1576076453), 347–348. ↑ Barton Wright, "Hopi Kachinas: A Life Force" Hopi Nation: Essays on Indigenous Art, Culture, History, and Law (University of Nebraska Digital Commons, 2008). Retrieved June 26, 2011. ↑ Taos Pueblo Retrieved October 13, 2007. ↑ James Abarr "Pecos reigned over early Pueblo world" Retrieved October 13, 2007. ↑ 14.0 14.1 "Isleta Pueblo" Catholic Encyclopedia (1910) VIII Retrieved October 13, 2007. Ellis, Florence Hawley "An Outline of Laguna Pueblo History and Social Organization" Southwestern Journal of Anthropology 15(4) (Winter, 1959): 325-347. Retrieved June 2, 2011. Fletcher, Richard A. Saint James' Catapult: The Life and Times of Diego Gelmírez of Santiago de Compostela. Oxford University Press, 1984. (on-line text, ch. 1) Retrieved June 2, 2011. Ryan D., and A. L. Kroeber Elsie Clews Parsons American Anthropologist, New Series, Centenary of the American Ethnological Society. 45(2)(Apr.-Jun., 1943): 244-255. Retrieved June 2, 2011. Wright, Barton, and Evelyn Roat. This is a Hopi Kachina. Museum of Northern Arizona, 1965. All links retrieved June 15, 2015. This page was last modified on 15 June 2015, at 19:17.